HP DesignJet 500 24" plotter w/o GL/2 card --> "HP Designjet 500 24 by HP"
HP DesignJet 500 42" plotter w/o GL/2 card --> "HP Designjet 500 42 by HP"
HP DesignJet 500 24" plotter with GL/2 card --> "HP Designjet 500 24+HPGL2 Card"
HP DesignJet 500 42" plotter with GL/2 card --> "HP Designjet 500 42+HPGL2 Card"
HP DesignJet 500PS 24" plotter --> "HP Designjet 500PS 24 by HP"
HP DesignJet 500PS 42" plotter --> "HP Designjet 500PS 42 by HP"
HP DesignJet 800 24" plotter --> "HP Designjet 800 24 by HP"
HP DesignJet 800 42" plotter --> "HP Designjet 800 42 by HP"
HP DesignJet 800PS 24" plotter --> "HP Designjet 800PS 24 by HP"
HP DesignJet 800PS 42" plotter --> "HP Designjet 800PS 42 by HP"
We have found that HP DesignJet 500 and HP DesignJet 800 plotters will install correctly in Windows 10, the proper driver will load and everything will seem fine except print jobs will never come out of the plotter. No error messages will appear on the computer either - Windows thinks the print job was completed properly even though nothing ever came out of the plotter. The simple solution is to switch the "ON setting to the "OFF" position - everything will then start printing immediately. This may or may not apply to more printers besides the HP DesignJet 500 and 800 series; at this point these are the only 2 models we have experienced this issue with. 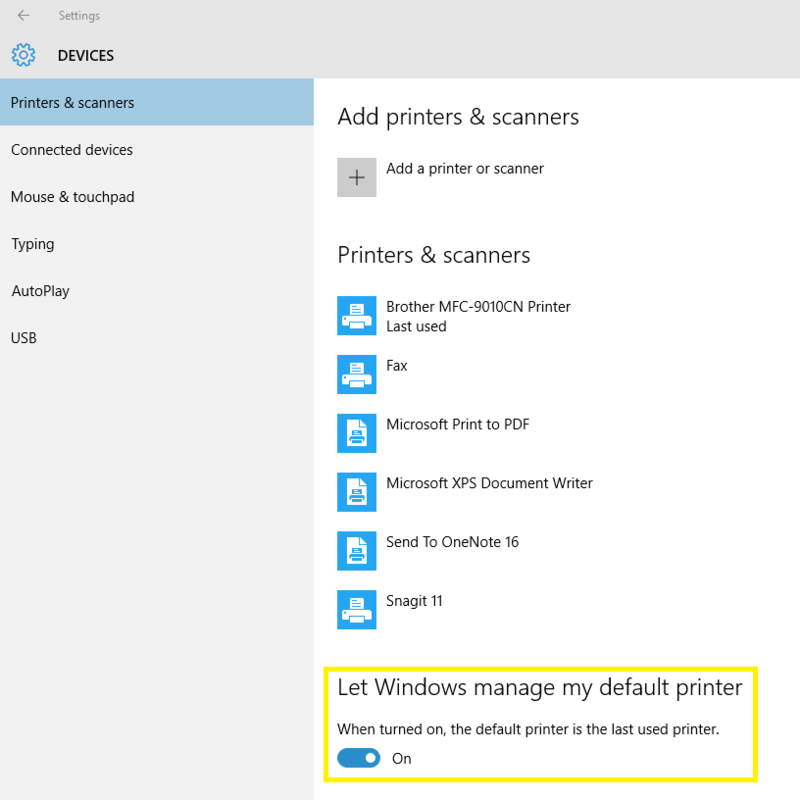 For that reason, we generally recommend you turn off the setting labelled "Let Windows manage my default printer".